You are here: Home / Seasonal / Fall / Creative Fall Mantel Decorating Idea! Creative fall mantel decorating idea with velvet pumpkins spilling out of the fireplace. Easy ways to transition your decorations from summer to fall. Scroll down for a fabulous GIVEAWAY for the VELVET PUMPKINS at the bottom of this post! In transitioning from summer to fall there just aren’t any real pumpkins in the stores yet. It’s a great time to be creative with using faux or fake pumpkins to give a slight suggestion for the season ahead. You know…the cozy season with sweaters, throws, changing leaves, heirloom pumpkins, spiced pumpkin latte and pumpkin everything! You’ve probably seen the heirloom pumpkins spilling out of a fireplace before. I think that the first time I saw this concept was years ago in Country Living magazine. You can do this with any pumpkins but I LOVE my velvet pumpkins from LoveFeastShop and have been displaying them for several years now. For a pretty tablescape idea, you might want to read THIS POST. In fact, if you’re looking for all of my FALL INSPIRATION, you’ll find that conveniently located in THIS SECTION. Kind of like a mini magazine. Here are a few tips for creating the look of pumpkins spilling out of a fireplace. Gather any and all of your faux (or real, later on) pumpkins. 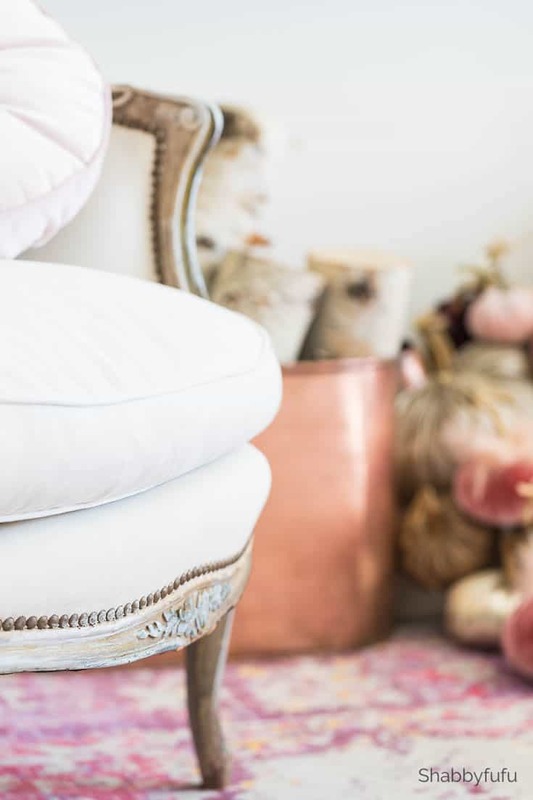 Grab a couple of bed pillows that perhaps aren’t in great shape and you’re thinking of replacing anyway. Stack up the pillows one on top of the other against the wall. Starting from the back wall, lay a few larger pumpkins on the pillows first. Layer pumpkins from bottom to top allowing them to have the look of spilling out one in front of the other. Fill in with some small pumpkins in the gaps. 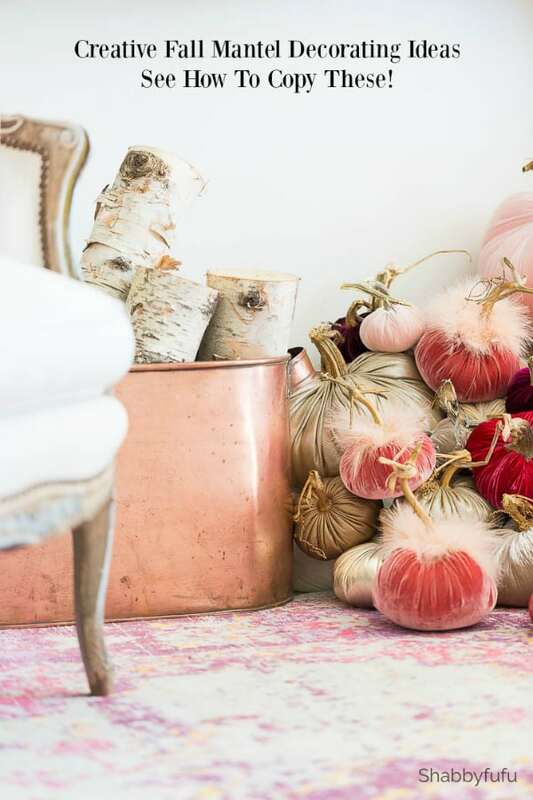 I went with a variety of velvet pumpkins in pink shades and I love how they look with my rug. Not much else is needed and the huge vintage copper bucket holds birch logs as firewood. The fur trimmed pumpkins are so unique and whimsical and Bartley is caught in the act of checking them out! Remember…you can do this with any pumpkins, but the velvet pumpkins are truly elegant and they make everyone happy! My partner LoveFeastShop has generously offered a GIVEAWAY for one of my lucky readers! You’ll receive a $150 GIFT CARD to their shop and can enter below. This giveaway is for U.S. addresses only and the winner will be selected randomly and notified via email. If you would like to SHOP in the meantime, you can use the code 18SF15 and receive 15% off through October! P.S….LoveFeastShop is a female owned business and I believe in women supporting women…so head on over and say hi on their Instagram or Facebook pages. I have another AMAZING female owned business coming soon of something fabulous! PIN THIS FOR YOUR INSPIRATION! These are beautiful. Hurry Fall!!! Gorgeous look! Makes me want to jump thru the screen and settle down with a pumpkin latte! Your pumpkins are gorgeous and I love how they are spilling out of the fireplace. I had no idea you had bed pillows underneath the velvet pumpkins. Your rug is awesome too! The pumpkins are awesome. I love your rug where did you get it? Everything looks so soft and girly. Those pumpkins look beautiful the way you have displayed them softly tumbling out of the fireplace. Very pretty. The velvet pumpkins are stunning! Really love the look of them spilling out! Those velvet pumpkins are gorgeous! This is the first time I’ve seen them spilling out of the fireplace. Thanks for the inspiration! Velvet pumpkins are so beautiful! Love what you have done with them, spilling out of your ‘fireplace’. 😀 Always beautiful, Janet! Such a beautiful room and the puppy is adorable. I loved the Chandelier and the Pumpkins. As they are different from ones we usually see. I definitely could use these ideas. I am sort of at a loss when it comes to decorating and so I usually rely on posts like this that help me to decorate. This looks absolutely beautiful. I’m loving all the rose pumpkins. The spillage look is fun, too. THe velvet was a great idea to get decadence into the look. Awesome giveaway! This mantel is stunning! I love all of the pumpkins. They’re so pretty and really brings out the space. Hi Janet, the colors you have put together are absolutely stunning! Thank you for sharing the give a way. I love this look! I’ll be bringing out all my fall decor on Friday. I’m excited to decorate. I’ll have to enter the giveaway! The pumpkins of my dreams! You always inspire, Janet. Oh how I love the velvet pumpkins. I tried to create my own once… the velvet quality on those pumpkins surpasses any velvet that I could find in the store. Love the shades of pink here! I used to wish that we had a mantle to decorate at Christmas time. You did a nice job incorporating the seasonal colors into your decor with yours. Sooooooo festive and Sooooooo pretty… luv it !! 🌸linda of no.cal. Those colors are gorgeous and you are really putting me in the mood for fall! Can’t wait till the weather cools down. These are really nice! I wish I had some crafting talent. You do such a nice job! Oh that looks so pretty with all the white! I need to do something like this. Awe that is such a cute idea! I really need to look at getting some new decor for fall. lovely, what did you use to clean your copper kettle? Velvet pumpkins are one of my loves. Love Feast has beautiful things. Thanks for the opportunity. Velvet pumpkins! How glamorous! I think it’s awesome that you’re sharing this, I really love how your mantel looks and it’s perfect for the season ahead. It’s always nice to decorate for the upcoming season! I would love to check out their products to see if there’s something that I can use for our mantel. This is really lovely! The velvet pumpkins are a classy take for Fall! The velvet pumpkins look so cute. I think this is such a creative and innovative idea with those pumpkins popping out of the fireplace. Gives a surreal effect. 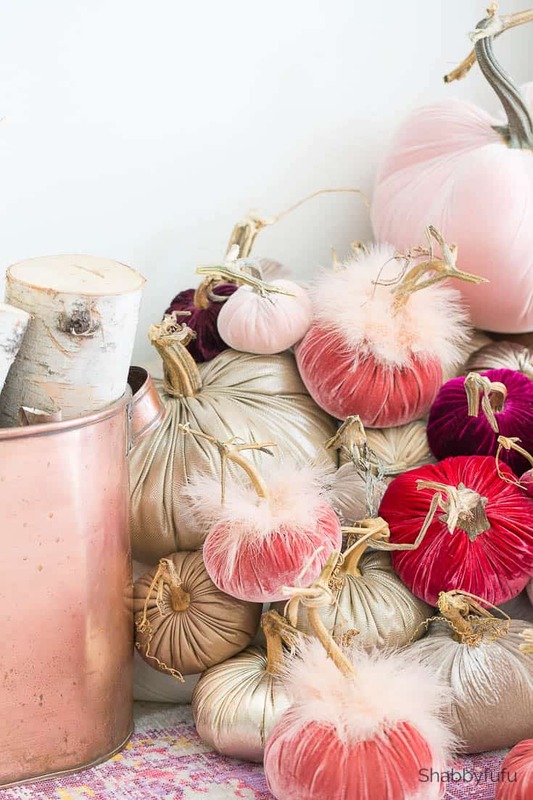 Oh my goodness, the idea of velvet pumpkins is gorgeous! Love how you put it all together and the color palette you chose. Oh my gosh how I love love love these pumpkins! Absolutely gorgeous, and the colors are perfect!!! I love those velvety pumpkins you have! Ahh Summer is fast ending, I am not ready for Fall yet. I love your fall mantle decor!! It is so cute! I can’t wait to get my fall decor out! This is it…this is the year I go with velvet pumpkins! Your seasonal decor is a winner EVERY season. I love all this, from the copper to the pumpkins. Janet, You never fail to inspire me! LOVE, the velvet pumpkins. I’ve been “collecting” them for about two years now. I have to keep them out of reach of our Westie, Mosby, as he is certain they are wonderful “balls” for him to play with. Thank you, for your lovely fall ideas without all the oranges. Blessings! Oh how funny Lila, LOL! We have 3 pups and thankfully they don’t care about playing with my pumpkins! Love those pumpkins – hope I win pink ones! I’ve never seen velvet pumpkins in these colors and I’ve absolutely fallen in love!! It’s great to think outside of the box for fall and yet it still gives you the same ambiance! Thank you! LoveFeastShop has such a wide array of colors and the best velvet pumpkins that I’ve found! 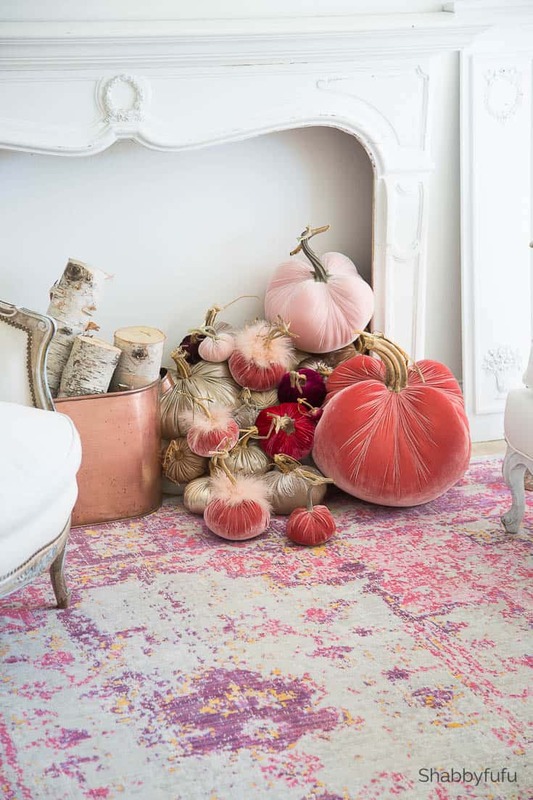 Any shade of pink is my favorite color, so I am drooling over those luscious pink pumpkins. Thank you for the giveaway. Thank you for stopping by Marilyn and we pink lovers need to stick together! Cannot wait ’til Fall! These velvet pumpkins are GORGEOUS! Love the pictures! Thank you Elaine! It’s Sept, so I think fall is definitely on the horizon. These pumpkins and the room and the decor is just beautiful! love it all! cute dogie too! I’ve always been afraid to move too far from center when it comes to colors and seasonal decorating, simply nor that comfortable with my decorating (or lack thereof) skills. 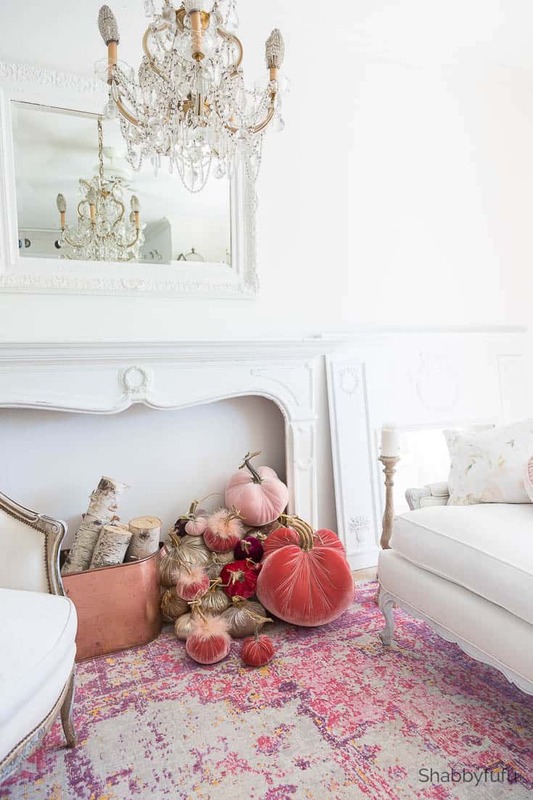 I must tell you that your white fireplace “cornucopia” spilling over with those luscious pink pumpkins is stunningly beautiful! I have never seen such a creative and elegant Autumn Mantel/Fireplace. Thank you for sharing this delight! Judy…what a delightful comment and I just love to challenge myself to come up with different ideas that I hope inspire! These are too cute. As always, you have inspired me to new heights!